This is not my favorite time of year. We still have a little snow in the yard and everything is a sad shade of “dead vegetation brown” except for the bits of grass sprouting near the warm house foundation. Most days are still too cold to barbecue outdoors and yet that is what I want to do. We are tired of heavy winter stews, casseroles and roasts, yet summer vegetable crops and fresh seafood will not be in our markets for a while yet. This scenario results in the “cooking blahs” for me, how about you? How do you combat your cooking blahs? . Personally, I find myself trying new dessert and cookie recipes. That is how I found this yummy treat. 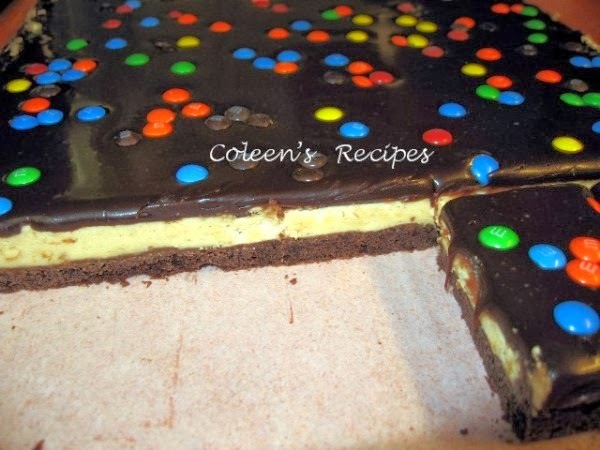 It has a chocolate cookie base (conveniently made with a cake mix) and a super creamy peanut butter center, topped with milk chocolate ganache. Served chilled, what's not to love here? Line a 10" x 15" baking pan with parchment paper (or foil) leaving the ends long so you can use them as handles (to lift the bars out of the pan) after they've cooled. Spray the parchment paper (or foil) with vegetable spray. Set aside. Mix the dry cake mix with 1/3 cup melted butter and 1 egg. Beat with electric mixer for 2 minutes or until well combined. This "dough" will be super thick. My Kitchen Aid mixer fitted with a paddle worked well. Press this into the bottom of your prepared 10x15 cake pan, trying to get it as even as possible. Bake at 350F for 12 minutes, remove from oven and cool completely in the pan. In a large mixing bowl, beat the peanut butter, butter and vanilla until very well combined and light in color. Beat in powdered sugar and 2 tablespoons of whipping cream. Mix well, then stir in the chopped peanuts. Spread this mixture over the cooled cookie crust. Place this in the fridge (or freezer) while you make the ganache topping. For the topping, heat 1/2 cup whipping cream, in a saucepan, just to the boiling point (don't let it boil). Remove from heat and add the milk chocolate chips. Do not stir, just let it sit for five minutes, then stir until smooth. Cool for 20 minutes. Gently spread (evenly) over the peanut butter bars. Chill for at least a couple hours. To serve, loosen the edges of the bars and lift them out of the pan, using the ends of the parchment paper. Cut them into bars. NOTE: Store covered in refrigerator. NOTE: Let these sit at room temperature about 15 minutes before you serve them. WOW! well those look too darn good. Best NOT make them or I won't fit in my jeans! If I make this, I'm going to keep all for myself. Looks so tempting! 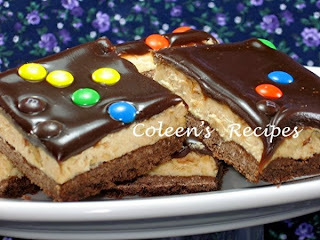 Grins, chocolate and peanut butter fans will sing your praises to the heavens for this, Coleen. I do like you do, look at new dessert items or bread items. My success rate lately has been 50/50, cooking up a storm but not all of it is something I'd want to share. I'm pushing the season a little, potato salad is on the agenda this week, I think, but that's something we love year round. They look awesome and I love the combination of flavours. Coleen those look to die for. Love the colors and all the flavors. Cant wait to make these for my kiddos. These bars look like something to make most anyone happy! I love the peanut butter filling. yum! I tend to just not bake much when I get those blahs. It usually doesn't last long for me though and sometimes I welcome the break! OMG! That looks positively sinful! I love it! Desserts are always my way of combating the kitchen blahs! These bars look great!!! What a way to break the blahs. Spring is already here and I'm sure not too far behind there. Thanks and keep on baking goodies. Oooh these look really yummy! Oh man yeah yum...... My husband just figured out he could make peanut butter brownies w/ cake mix and he and th 2 year old are in heaven! He would be sitting on your door step tonight w/ plate in hand if he saw those pixs! Those must go on my to-try list. Oh yes Coleen these are a keeper alright! gosh those pictures are seriously tempting me! how yummy! when i get the cooking blahs, i'll give myself a week or so break without even thinking about cooking. before i know it, i miss cooking and i'm ready to get back in the kitchen. good luck! 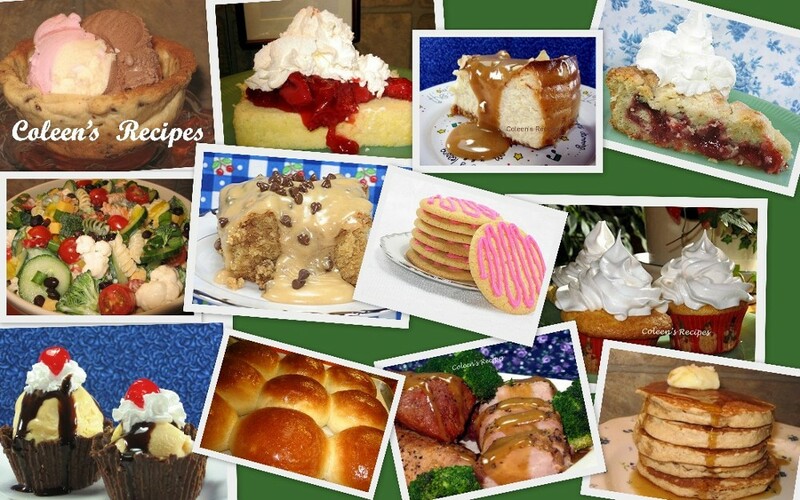 When I have cooking blues I heard toward baking. I prefer baking to cooking anyhow. I love baking cakes. Those bars look very good and I have a jar of peanut butter that I need to use! I'm really surprised by how well these cut. They look perfect! How do I battle the blahs? We go out to eat. ha ha! To the dismay of the kiddos the blah's come on all to often. That's when I say let's fun and get something out.